We are the international distributor and representative for SMTube - a rapid 5 seconds tear function diagnostic test of Dry Eyes or Keratoconjunctivitis Sicca (KCS) and our representation covers the global continents notably the North, Central & South American, European, Asian, Middle Eastern, Mediterranean, African, Australian & Oceanic continents. 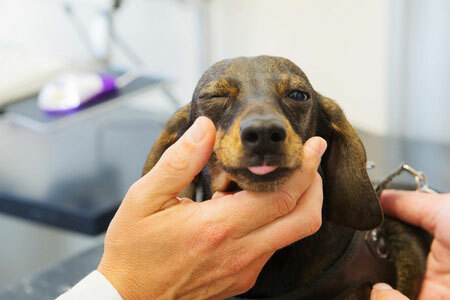 Dry Eye disease is a common condition as a result of inadequate tear productions in the canine breeds. It could affect double digit percentages of the dog population and could be higher for certain breeds but could also affect any dogs in their adult stages. Dry Eyes, if left untreated could lead to mucus and pus filled conjunctivitis and ulcers and scarring on the cornea. In felines, although Dry Eyes is not as common as in the canine breed, it can affect various breeds of cats. And in a common condition of Pink Eye (Conjunctivitis) in cats and dogs, a specific diagnosis often requires measurement of the tear volume. In the diagnosis of Dry Eye disease, tests and procedures are used and one of these includes measuring the tear volume. A new method, termed Strip Meniscometry aims to aid the efficacy, handiness, and rapidity in the measurement of tear volume during a tear function test. Strip Meniscometry was coined following the publication of its first clinical trial in 2006¹ as a novel methodology of tear function test. This new methodology measures the tear volume rapidly (5 seconds) and without necessarily touching the conjunctiva or cornea. A second clinical trial in 2011² was published on the evaluation on the sensitivity and specificity of this new methodology. Based on this methodology, a disposable device called Strip Meniscometry Tube (hereinafter called the SMTube) was developed to conveniently put Strip Meniscometry method into practice to improve user and the patient experiences and comfort. 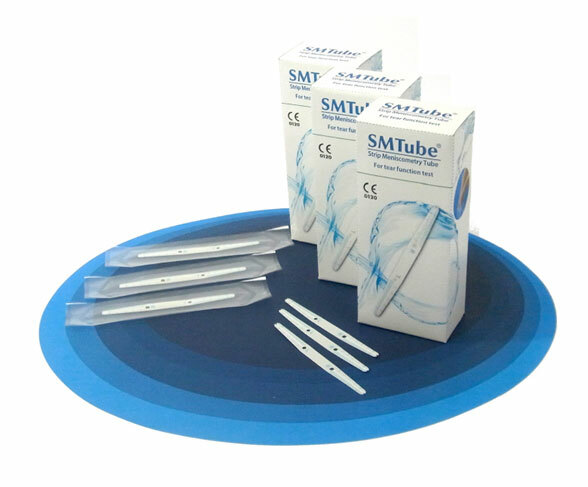 SMTube is a thin long strip (Size L 85mm W 7mm H 0.3mm) with central tubes filled with absorber, and a natural blue dye is placed at the entrance of tubular structure. Each SMTube is meant to be used for both Left and Right eyes. When SMTube is applied to the lateral lower lid tear meniscus, SMTube absorbs tears utilizing the capillary action of absorber located in the central tubular ditch. The Blue dye indicator placed at the end of SMTube moves with absorbed tear, and after 5 seconds, the length of the stained tear column can be read to evaluate the tear function. References ¹ and ² are available upon request.